With a growing focus on mental health within employability services, how have providers adapted their service offer? What options do they have for developing their services, ensuring that they are sensitive and responsive to the needs of people experiencing mental health problems? We have identified four lessons from our recent work with employability programmes. The importance of people with (mental) health problems receiving additional support when moving into work is part and parcel of No One Left Behind, Scotland’s latest employability strategy. The Strategy emphasises how crucial an inter-agency approach is to enabling people with multiple barriers, including mental health, move into employment. EmployabiliTAY, one of the Scottish Government’s Employability Innovation and Integration Fund’s pilots which we have been evaluating, has done exactly that: integrating their employability service with housing, criminal justice, money advice and mental health services. One session of the three-week programme is led by an NHS Mental Health Nurse – here, the focus is not on treating clients’ mental health problems per se, but on making clients aware about how their lifestyle choices, such as their sleep or eating habits, affect their mental health and wellbeing. The programme also has Growth Mindset specialists delivering a session focusing on changing clients’ negative self-image and growing their confidence. For services to support mental health and employability together, the traditional skills found in employability staff need to widen. Many services are addressing this by having mental health experts and employability experts work side by side. However, even where this is occurring, there is an increasing recognition of the need for all employability service staff (and their volunteers) to have a core set of skills in relation to mental health. This means that, while not all staff are treating mental health issues, they are all able to identify issues, signpost, and tailor their support to their particular needs. The importance of this was recognised by NHS Education Scotland who launched the National Trauma Training Framework in 2017. This recognised the need for all public services to be ‘trauma informed’: that is, recognising the impact of trauma on their service users and adapting their practices accordingly by establishing trusting relationships with clients and resist re-traumatisation. Our training needs assessment for NHS Greater Glasgow and Clyde showed that staff members across a range of services feel that they have a good understanding of what trauma is but would value more training to build their confidence in using trauma informed practice as a core part of their services. A youth employability programme we are currently evaluating recognised the high prevalence of mental health issues among their young participants. In response, mentors have received a one-day training on how to work with and support young people experiencing mental health problems. This ensures that they can identify mental health problems early on and engage with young people sensitively. Our work has shown that moving into work is only a first step. Sustaining work can be at least as challenging as moving into employment. EmployabiliTAY ensures that mental health support continues when clients move into work. Participants are able to continue to meet with the NHS Mental Health Nurse if moving into work leads, for example, to increased stress and a resurgence in their anxiety. Health problems, including mental health problems, are one of the major reasons for people dropping out of work. This has long been recognised through programmes such as Healthy Working Lives in Scotland. Recently steps have been taken to try to make it easier to know where to go for help for those struggling in work. The Scottish Government’s Health and Work Support Pilot is an example of this. It focuses on providing quick access to support for clients who are at risk of losing their job or have recently left their job due to ill health. The Pilot aims to streamline the service landscape by bringing together work- and health-related services and providing clients with a single-entry point to access the support that they need, preventing people from falling out of work and becoming long-term unemployed. There are a growing number of programmes across the UK working at this intersection between mental health and work, and it is exciting to see this spread and lessons being learnt and applied. Stay tuned for the next blog in this series where we explore how mental health services have sought to include employability as part of the recovery journey. Max Lohnert is a Consultant in Rocket Science’s Edinburgh Office. 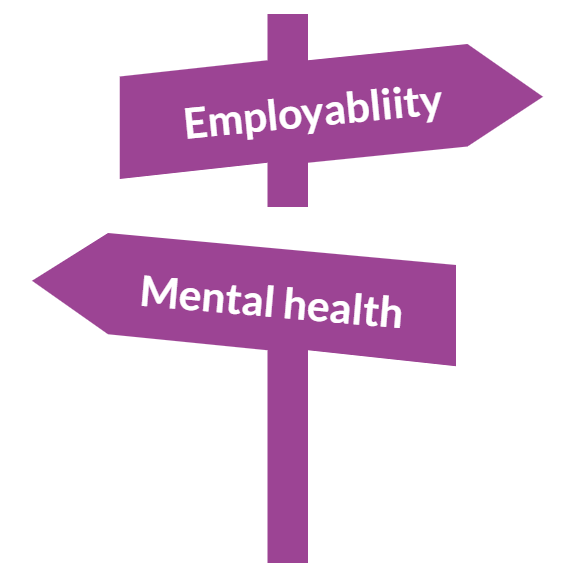 This blog is part of a wider series of blogs on the intersection between employability and mental health.